In medieval Arab historiography, people of African descent are referred to as Zanj (plural: zunuj) or Habshi (plural: ahabish). The name Zanj was used by Arab geographers and historians for Africa. The word Habshi is derived from Habsha, or Abyssinia. The ancient Greeks referred to Abyssinia as Ethiopia. The institution of slavery dates from 9th century Iraq. Slaves were obtained from Africa as well as Central Asia and Turkey. From the 9th century onwards, the slave troops of Turkish and Central Asian origin were the core of the Abbasid armies. 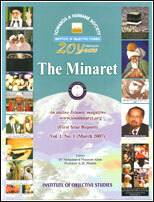 The Seljuq minister Nizamul Mulk (d. 1092) wrote in Siyasat Nama, “One obedient slave is better than 300 sons; for the latter desire their father’s death, the former his master’s glory.” Ibn Khaldun considered black Africans to be the only people who accepted slavery ‘because of their low degree of humanity and their proximity to the animal stage.’ There was an extensive network of slave trade in the medieval period, in which Arab traders played the most prominent role. African slaves were obtained by capture or purchase. Arab traders often exchanged African slaves for clothes, manufactured goods, metalwork and beads from India and Persia. In the 13th and 14th centuries, tens of thousands of Africans were sold to ruling dynasties in the Muslim world. Ethiopia’s Christian kingdom collaborated with long-distance Muslim traders in exporting African slaves to Muslim lands. The number of African slaves which was exported by Arab traders across the trans-Saharan trade route reached a total of 1,740,000 in the period 900-1100. Andre Wink has written that the importation of black slaves to Muslim countries from Spain to India over a period of more than a thousand years surpassed in numbers the African slave trade to the New World. Most of the African slaves were recruited in the army and some were employed as attendants, bodyguards and domestic servants. Some of them rose to high military and administrative positions and joined the ranks of the nobility. 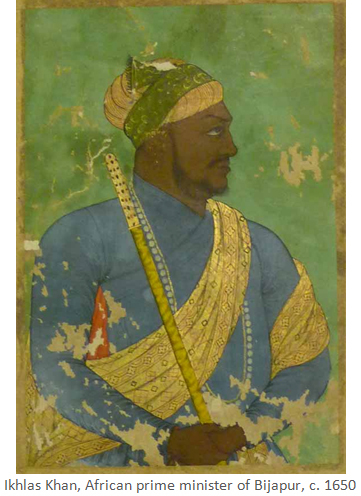 Jamaluddin Yaqut was an Ethiopian slave who acquired a prominent position during the reign of Razia Sultana in the Delhi Sultanate (ruled 1205-1240). The trade in African slaves intensified in the 14th and 15th centuries. 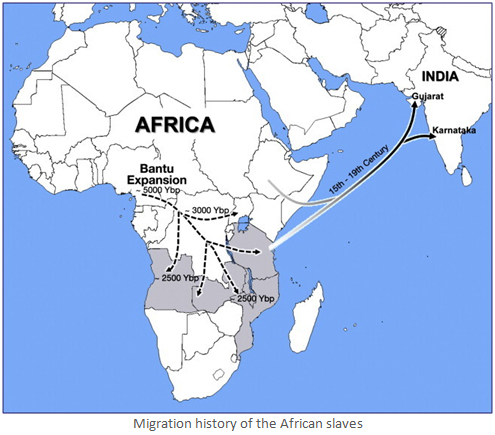 African slaves were mostly brought to the Deccan and Bengal. Indian textiles were in great demand in Africa. Slave traders often exchanged Indian textiles for slaves, gold and ivory. In the court of the Bahmani king Firuz (1397-1422), African slaves or Habshis served as personal attendants, bodyguards and guards of the harem. Sultan Ahmad Shah Bahmani II (1436-1458) entrusted such coveted posts as governorship and keeper of the royal seal to Habshi slaves. Sultan Mahmud Shah Bahmani (ruled 1482-1518) appointed a Habshi, Dilawar Khan, as his finance minister. Mahmud Gawan (d. 1481), a prominent and influential Bahmani prime minister, appointed a Habshi as his personal seal bearer and another Ethiopian slave as the governor of Kolhapur. Very few Habshi women were brought to the Deccan as slaves. 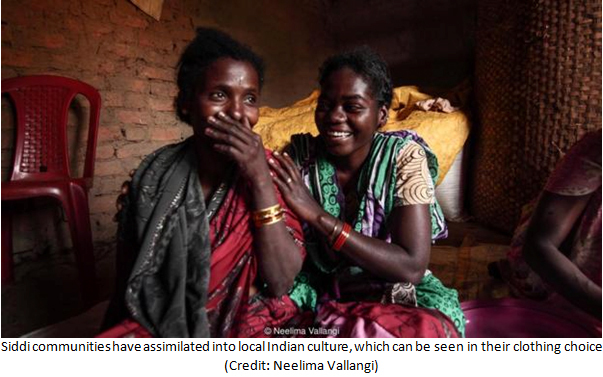 Consequently, Habshi men married local women, mostly from the lower strata of society. In the course of time, they lost touch with their native languages, customs and traditions and adopted regional languages, food habits and dress patterns. However, their physical features, notably their curly hair and the braided cornrows of girls, set them apart from the mainstream society. 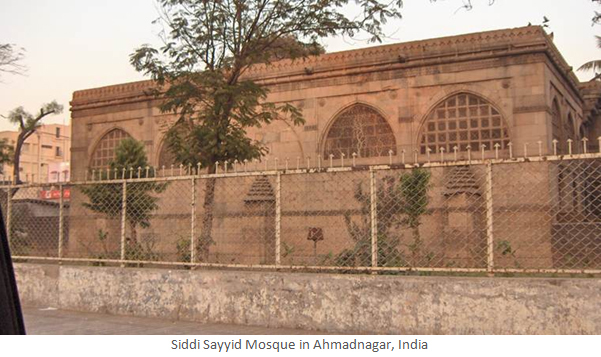 A well-known architectural symbol of the political and administrative prominence of people of African origin in India is the Siddi Sayyid Mosque in Ahmadabad. It was built in 1573 by Siddi Sayyid, who was in the retinue of Bilal Jhajar Khan, a general in the army of Sultan Muzaffar Shah III of Gujarat Sultanate. 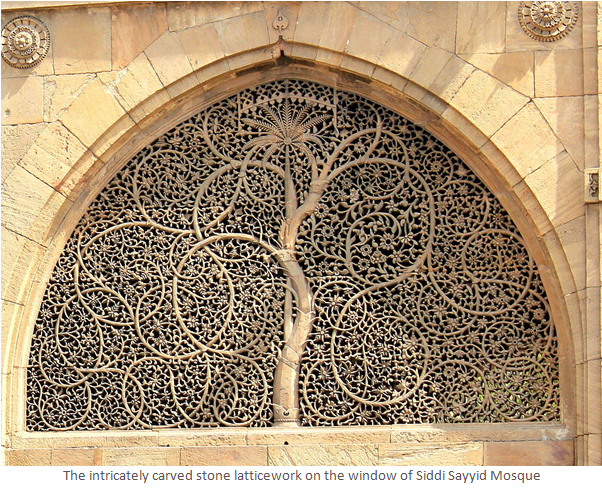 The mosque is well known for its intricately carved stone latticework on the window and on the side arches. Malik Ambar, who lived in the Deccan in the second half of the 16th century, was an Ethiopian slave. His original name was “Chapu”. He fell into the hands of slave traders and was sold and resold several times. He was taken to Baghdad and sold to a wealthy and prominent merchant, who raised and educated him, converted him to Islam and gave him the name “Ambar” (Arabic for ambergris). From Baghdad he was taken to the Deccan, where he was purchased by Chengiz Khan, an Ethiopian who was the chief minister of the Nizam Shahi sultanate of Ahmadnagar. The ruling class in Ahmadnagar and Bijapur had a large number of Habshi slaves in their service. When his patron Chengiz Khan died, Malik Ambar was freed by the widow of his master and he became a free lancer. 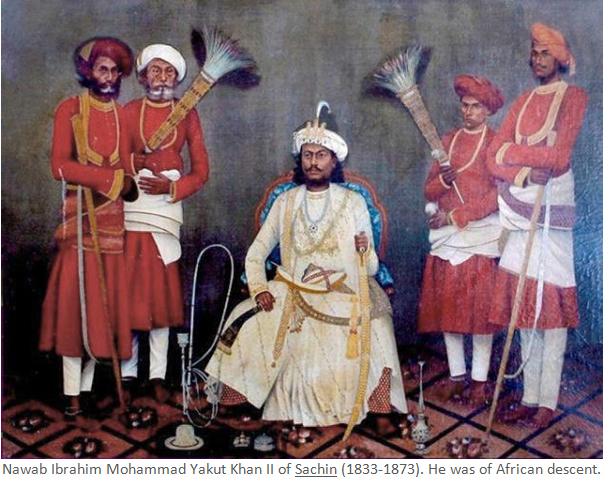 For some time, he joined the service of the ruler of Bijapur, who placed him in charge of a small contingent of troops and gave him the title of “Malik”. In 1595 he left Bijapur with 150 loyal cavalrymen, returned to Ahmadnagar and joined the service of another Habshi commander, Abhang Khan. During this time, the Nizam Shahi rulers of Ahmadnagar and the Mughal rulers were at war. In 1595 the Mughals besieged Ahmadnagar, but Malik Ambar and his soldiers managed to break through Mughal lines. Ambar’s comparatively small contingent was no match for the Mughal army’s formidable artillery, infantry and heavy cavalry. But, with his astuteness, he made up for his weak position by employing the technique of gorilla warfare. He mounted surprise night attacks, disrupted Mughal supply lines and confronted Mughal forces in wooded hills and ravines. Maratha cavalrymen in Ambar’s army carried out deadly gorilla attacks on Mughal forces. Under Malik Ambar, the units of Maratha cavalry in Ahmadnagar’s service grew from 10,000 in 1609 to 50,000 in 1624. Richard Eaton has remarked that under Malik Ambar’s leadership, the Ahmadnagar sultanate became a joint Habshi-Maratha enterprise. With his exceptional leadership qualities, Malik Ambar gathered 3,000 loyal and disciplined cavalrymen around him. His troops grew to over 7,000 within a short period. Taking advantage of the political uncertainty and chaos in the Nizam Shahi dynasty, Ambar offered his daughter in marriage to a scion of Ahmadnagar’s royal family and canvassed support for him as the future ruler of the Nizam Shahi sultanate. After the marriage in 1600, Ambar’s son-in-law was sworn in as Sultan Murtaza Nizam Shah II and Ambar took charge as the peshwa or prime minister of the Nizam Shahi kingdom. By then Ambar was wielding enormous power in Ahmadnagar’s political and military affairs. He controlled the territory to the south and east of Ahmadnagar and made Junnar as his capital. In 1610, Ambar’s army had 40,000 Deccanis and 10,000 soldiers of African descent. 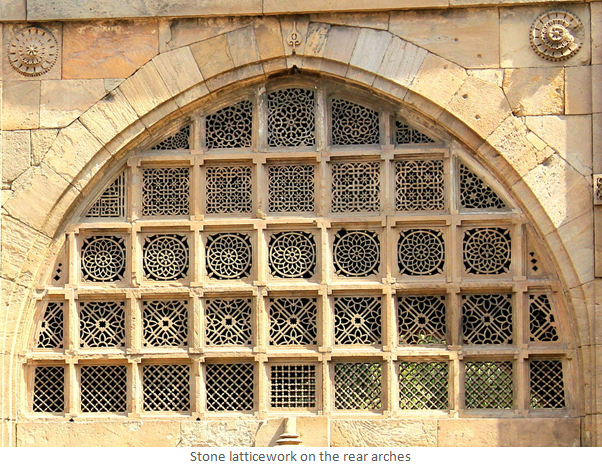 His troops defeated the Mughal army several times and in 1610 Ambar drove out the Mughals from the Ahmadnagar fort. Angered by a quarrel between his daughter and her senior-co-wife, who taunted her of being the daughter of a black slave, Ambar ordered his secretary to poison both his son-in-law and his senior wife. He then enthroned Murtaza’s five-year son as Sultan Burhan III. After Malik Ambar’s death in 1626, his son Fateh Khan succeeded him as the Nizam Shahi kingdom’s prime minister, but he was soon overpowered and defeated by the Mughals. By the 18th century, the political and military prominence of the Habshis declined. 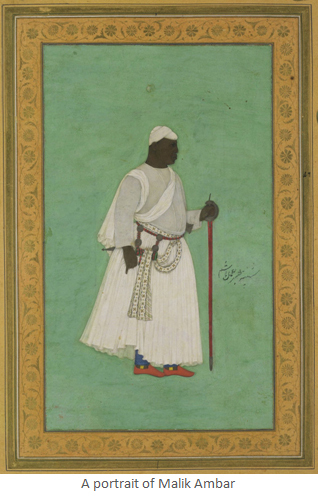 Yaqut Khan, who was of African descent, served as an administrator in the Bijapur Sultanate and later in the Mughal Empire. He was given the title of Yaqut Khan by the Mughal Emperor Aurangzeb. During the Mughal-British conflict, Emperor Aurangzeb ordered Yaqur Khan to lay siege to Bombay, then held by the British, in 1689. Yaqut Khan later joined the Janjira fort as a naval admiral. Janjira, now known as Murud-Janjira, is an island in the Raigadh district of Maharashtra. Janjira is a corrupted form of the Arabic word jazeera, meaning island. 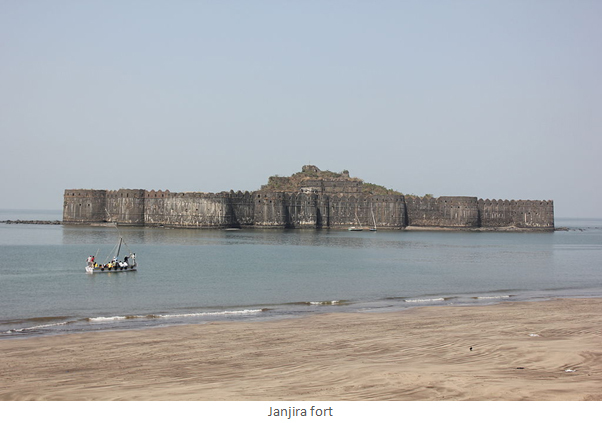 The Janjira fort, was constructed by Malik Ambar. The demand for military slaves in Ahmadnagar ended with the ascendancy of the Mughals, who did not employ people of African descent in the army, and the collapse of the Nizam Shahi kingdom in 1636 and of Bijapur kingdom in 1686. The Siddis, also known as Siddhi or Sheedi, are descendants of male and female domestic slaves brought from East Africa by Arab and European slave traders in the 18th and 19th centuries. They are largely concentrated in Karnataka, Gujarat, Hyderabad, Daman and Diu and Goa in India and in Makran and lower Sindh in Pakistan. The population of Siddis is estimated to be around 250,000-350,000. Their population in India is around 60,000. 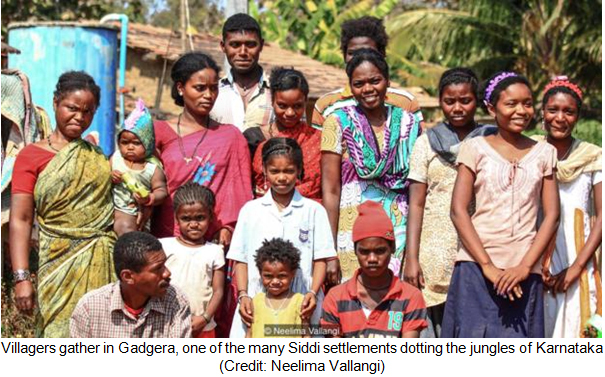 Most of the Siddis are Muslim, but a section of them follow Hinduism and Christianity. They speak a variety of Indian languages, including Urdu, Hindi, Balochi, Sindhi, Kannada, Gujarati, Marathi and Konkani. The Siddis are accorded the status of a scheduled tribe in Karnataka, Gujarat, Goa and Daman and Diu. The presence of the Siddis in Hyderabad goes back to the 18th century. They served as cavalry guards of the Asaf Jahi rulers of the erstwhile princely state of Hyderabad. In Gujarat, the ancestors of the Siddis are believed to have been presented as slaves by the Portuguese to the Nawab of Junagadh. 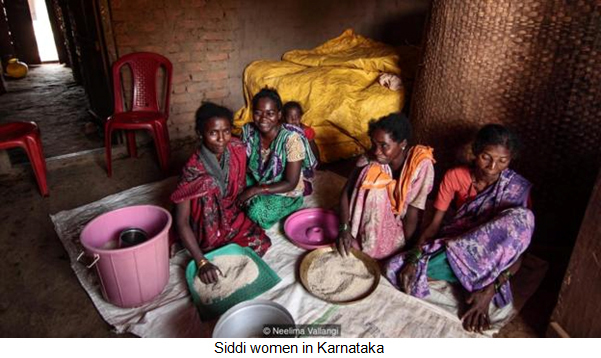 In Karnataka, most of the Siddis live in rural areas and work as farmers and wage labourers. By and large, the Siddis have assimilated into Indian society and have adopted local languages, religious beliefs and rituals, customs and food habits. However, certain African features such as music and musical instruments and certain forms of dance have survived. 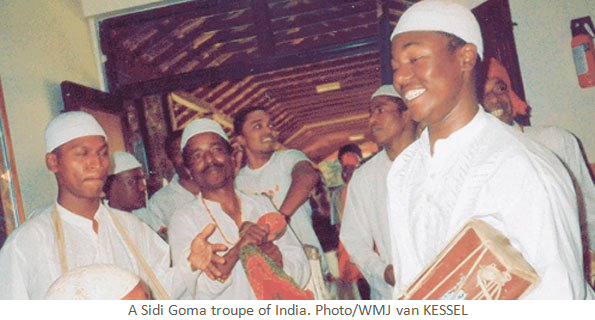 Goma music and dance, locally known as dhamal, are a prominent feature of Siddi festivities. The word Goma is derived from the Swahili word ‘ngoma,’ which means drum. In Pakistan, the Siddis are generally known as Sheedi. They also call themselves Qambaris, which has reference to Qambar, a feed slave of the fourth caliph, Ali. 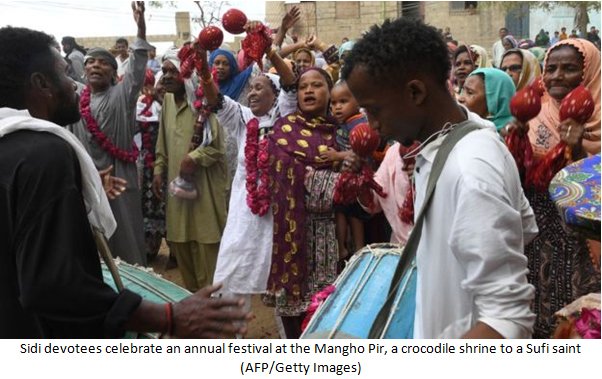 Pakistan’s Sufi saint Pir Mangho is regarded as the patron saint of the Sheedis and his annual urs is celebrated with great enthusiasm. A prominent feature of Sheedi culture in Pakistan is an annual festival, known as Habshi Festival, which is marked by a great deal of singing, music and dancing. 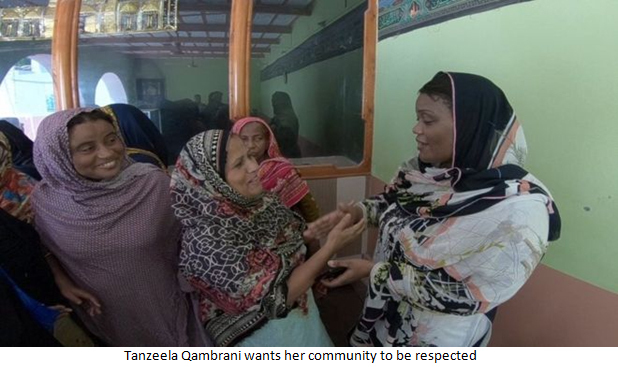 Tanzeela Qambrani, a woman of Siddi descent, became the first Sheedi woman to be elected as a member of the Provincial Assembly of Sindh in 2018.